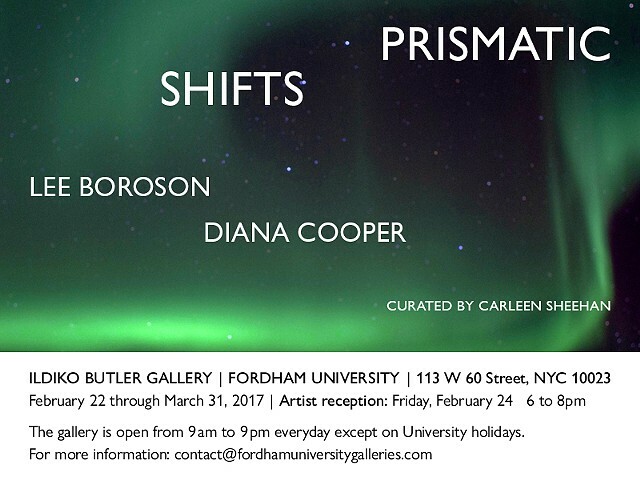 PRISMATIC SHIFTS will feature site-specific works by artists Lee Boroson and Diana Cooper, working in collaborative engagement with each other’s work and the space surrounding the gallery. Both artists were inspired by the physical space of the Butler Gallery itself, which, with it’s glassed-in front wall and small lense-like windows onto 60th Street, functions as both a vitrine to showcase work and as a prism that reflects and refracts the activities taking place outside it. Both artists share an inclination for engaging and altering our perception of environments in simple yet innovative ways, and they plan to construct artworks that will connect visually to the architecture and activity of both the Lowenstein lobby and the street outside, underscoring the fluidity of our perception of the built and natural worlds, and the ways in we make connections and generate meaning through visual language.